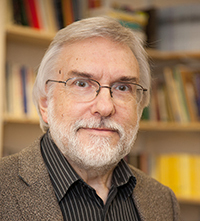 Howard Davis (BA Cambridge; PhD Edinburgh) was appointed Professor of Social Theory and Institutions at Bangor University in 1997 and was Head of the School of Social Sciences from 1999-2007. He worked previously at the universities of Kent and Glasgow, where he was a founder member of the Glasgow Media Group. He is a Fellow of the Academy of Social Sciences. From 2008- 2018 he was Co-Director of the Wales Institute for Social & Economic Research, Data & Methods (WISERD). His main areas of research are social theories of culture and creativity; cultural formations and transitions in post-Soviet societies; social identities at local, national and international levels; research methods for the sociological analysis of culture, language and identities. His most recent project is part of WISERD Civil Society and examines experiences of participation at the local level and their implications for civic exclusion and expansion. Dallimore, D, Davis, H, Eichsteller, M & Mann, R 2019, Pushing the boundaries of Big Local. Local Trust. Dallimore, D, Davis, H, Mann, R & Eichsteller, M 2018, 'Place, belonging and local voluntary association leadership' Paper presented at International Society for Third Sector Research, Amsterdam, Netherlands, 10/07/18 - 13/07/18, . Dallimore, D, Davis, H, Eichsteller, M & Mann, R 2017, 'Place, belonging and the determinants of volunteering' Paper presented at Voluntary Sector and Volunteering Research Conference 2017, Nottingham, United Kingdom, 7/09/17 - 8/09/17, . Davis, H, Day, G, Eichsteller, M & Baker, S 2017, 'Language in autobiographical narratives: Motivation, capital and transnational imaginations', Language, Discourse & Society, vol. 5, no. 1, pp. 53-70. Dallimore, D, Davis, H, Mann, R & Eichsteller, M 2016, 'Civil Society: Participation in Wales, in place and over time' Paper presented at WISERD Annual Conference 2016, Swansea, United Kingdom, 5/07/16 - 7/07/16, . Davis, HH, Dawson, M (ed. ), Fowler, B (ed. ), Miller, D (ed.) & Smith, A (ed.) 2015, False Self-Employment. in Stretching the Sociological Imagination: Essays in Honour of John Eldridge. Palgrave Macmillan, pp. 83-98. Davis, HH & Wright, J (ed.) 2015, Alan Touraine. in International Encyclopedia of the Social & Behavioral Sciences. Elsevier Science. Davis, HH 2014, 'The category of religion in Alain Touraine's critique of modernity' Paper presented at XVIII ISA World Congress of Sociology. Facing an unequal world: Challenges for Global Sociology, 13-19 July 2014, Yokohama, Japan, 3/01/01, pp. -. Davis, H, Day, G, Baker, S & Eichsteller, M 2012, International Education in the Life Course. in G Day & R Miller (eds), The Evolution of European Identities: Biographical Approaches. 2012 edn, Palgrave Macmillan, pp. 45-60. Language Acquisition in Biographical Narratives: Steps in Supranational Identity Formation. Davis, HH & Baker, S 2010, 'Language Acquisition in Biographical Narratives: Steps in Supranational Identity Formation.' Paper presented at XVII World Congress of Sociology. International Sociological Association, Gothenburg, Sweden, 3/01/01, . Inside out: An 'English' dispersal into North-West Wales. Attitudes to Language and Bilingualism among English In-Migrants to North Wales. Davis, HH, Day, GA & Morris, D (ed.) 2010, Attitudes to Language and Bilingualism among English In-Migrants to North Wales. in Welsh in the Twenty-First Century. 2010 edn, University of Wales Press, pp. 148-167. Representations of Otherness in Russian Newspapers: the theme of migration as a counterpoint to Russian national identity. Davis, HH & Sosnovskaya, A 2009, 'Representations of Otherness in Russian Newspapers: the theme of migration as a counterpoint to Russian national identity. ', Journal of Intercultural Communication, vol. 21, pp. 1-15. Beharrell, P, Davis, HH, Eldridge, J, Hewitt, J, Hart, J, Philo, G, Walton, P & Winston, B 2009, Bad News. Routledge. Educational and other encounters: narratives of mobility and the biographical significance of international study and training in Europe. Davis, HH, Baker, S, Day, GA & Kowalska, M 2009, 'Educational and other encounters: narratives of mobility and the biographical significance of international study and training in Europe.' Paper presented at European Sociological Association, Lisbon 2-5 September 2009, 3/01/01, . Exploring European identities through biographical narrative interviews. Davis, HH, Baker, S, Day, GA & Kowalska, M 2009, 'Exploring European identities through biographical narrative interviews.' Paper presented at British Sociological Association Annual Conference, Cardiff 16-18 April 2009, 3/01/01, . Beharrell, P, Davis, HH, Eldridge, J, Hewitt, J, Hart, J, Philo, G, Walton, P & Winston, B 2009, More Bad News. Routledge. Notes from an island: using biographical narratives to interpret the meanings of Britishness and Europeanness. Davis, HH, Baker, S, Day, GA & Kowalska, M 2009, 'Notes from an island: using biographical narratives to interpret the meanings of Britishness and Europeanness.' Paper presented at International Institute of Sociology, 39th World Congress, Yerevan June 11-16 2009, 3/01/01, . Davis, HH, Fleck, C (ed. ), Hess, A (ed.) & Lyon, ES (ed.) 2009, Revisiting the concept of the Public Intellectual. in Intellectuals and Their Publics: Perspectives from the Social Sciences. 2009 edn, Ashgate. Day, GA, Day, G, Drakakis-Smith, A & Davis, HH 2008, 'Migrating to North Wales: The 'English' Experience', Contemporary Wales, vol. 21, no. 1, pp. 101-129. Day, GA, Day, G, Drakakis-Smith, A & Davis, HH 2008, 'Portrait of a Locality? The local press at work in North West Wales 2000-2002', Contemporary Wales, vol. 21, pp. 25-26. The regional and the global in the context of changing cultural production. Davis, HH & Yerofeyev, S 2007, 'The regional and the global in the context of changing cultural production. ', Regionologiia, vol. 4, pp. 5-14. Building a Tatar elite: Language and national schooling in Kazan. Davis, HH 2005, 'Mediating religion in post soviet Russia: Orthodoxy and national identity in broadcasting', Studies in World Christianity, vol. 11, no. 1, pp. 65-86.